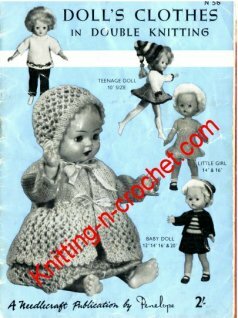 "Free knitted doll clothes patterns"
To fit Fashion Doll height approximately 28-33 cms [11-13 ins]. 4 ply. 35g. Pair needles size 3 1/4 mm (No 10). Length of lace and fancy trimming for edgings. 28 sts and 36 rows = 10 cms [4 ins] square measured over st st using 3 1/4 mm needles. Using 3 1/4 mm needles cast on 117 sts. 1st row: K1, *p1, k1; rep from * to end. 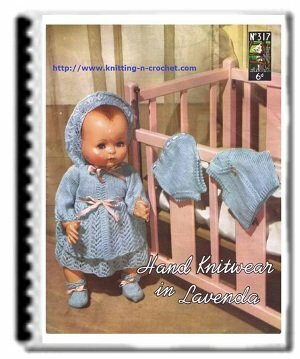 <p>Work in st st, starting knit, until skirt measures approximately 14 cms [5 1/2 ins] ending with a purl row. Next row (decrease): K2, *k3tog; rep from * to last st, k1. 41 sts remain. Next row (decrease): P1, *p2tog; rep from * to end. 21 sts remain. Next row (increase): K2, [inc in next st, k3] 4 times, inc in next st, k2. 26 sts. Next row (increase): K2, [inc in next st, k4] 4 times, inc in next st, k3. 31 sts. Using 3 1/4 mm needles cast on 26 sts then cast off these 26 sts knitwise. Join back seam. Sew straps to front of bodice for halter neck. Sew lace round top edge of bodice. Sew lace and trimming round lower edge of skirt as illustrated.